Tip: Don’t make more than you can consume in one sitting. This dish doesn’t reheat well. Fun fact: I have actually followed a number of the food bloggers featured in this video. Fry the tofu in some oil, or sautee the mushrooms such that they brown slightly. Add the garlic to the pan and cook until it becomes fragrant. Take the skillet off the heat, letting it cool with the tofu or mushrooms. This is the most important step if you would like to avoid the pasta scrambled eggs scenario. Beat the eggs, pepper, and cheese together (but not too much). Set aside. Cook the pasta in salted boiling water (it usually takes me about 10 minutes). Drain the pasta, setting aside a bit of water (about 1/4 cup). Mix the pasta with the tofu/mushrooms in the skillet. Pour the egg and cheese mixture in the skillet and turn the pasta so that the egg coats each noodle well. Add a bit of the reserved pasta water to make it saucy. Turn the heat to medium low and continue to swirl the pasta around, watching carefully. You want the egg to thicken and become creamy, but not overcook. As soon as the consistency has changed to being creamy, take the pasta off of the heat and plate. Garnish with a bit of parsley and cheese. My spirit vegetable is garlic. I’ve been in a “back to basics” cooking mood as of late, and which cuisine is better for this than Italian food? Dead simple recipes with fresh ingredients prepared in less than 30 minutes. But after the 6th pasta night, a girl goes a little stir crazy. Here’s an American twist on the classic Italian knock out. Steam the broccoli for 2-3 minutes. In a saute pan, heat the olive oil, garlic, and red pepper in medium-low heat. The garlic should not brown, but rather become very fragrant. Do this for about 10 minutes, or until you can see the oil start to turn a bit red from the chili flakes. Add the broccoli, lemon juice, lemon zest, Parmesean cheese and salt to taste. Spoon the mixture over each slice of toast. Place one slice of cheese on top of each sandwich. Broil the sandwiches until the cheese gets bubbly and turns a little brown – maybe around 4 minutes. One of the highlights of living in Europe is being closer to Italy. I like the other countries too, but… Italy! I recently discovered an Italian food mail order service: there is a farm in Tuscany, and they will send you Italian products via post. Since it’s from a farm, they only ship you products in bulk. And sometimes they give you recipes, too. This is one of those recipes. What can I say? The number of times a girl comes across a vegetarian confit recipe are few and far between. Cut the cherry tomatoes in half and lay them on a piece of parchment paper on top of a cookie sheet. In a small bowl, mix the olive oil, thyme, oregano, sugar, garlic well. Add some salt and pepper to taste. Spoon a bit of the spice mix over each tomato half. Bake this for 2 hours at 140 C. We want the tomatoes to be roasted but not dry/browned. In a skillet, lightly warm the pesto. Toss the pesto and tomatoes together with the cooked pasta in the skillet. On one of our recent trips to Milan, we discovered this delicious holiday fruit bread. It’s a classic Italian Christmas staple. Strangely, it was priced pretty high as far as fruit breads go, so I decided to try making it at home to see what the fuss was about. It’s quite a bit of time (mostly waiting for the dough to rise), but not more work than making normal bread or pizza dough – definitely worth it to make at home. My favorite part is the candied orange peels. Normally, this is made with a special deep cake form so that the Panettone poufs over the top, but I used a 20 cm springform cake pan instead (who has time to get a special pan for one dish?). Knead together the starter ingredients and cover in a bowl to rest overnight (8-12 hours). Combine all the dry dough ingredients in a large bowl: flour, salt, sugar. In another bowl, mix together the yeast water, eggs, butter, and vanilla. Add all of the starter to the wet mixture and start kneading the flour mix in thirds. Allow the dough to rise, covered, for 90 minutes. Knead in the fruits and zest. Shape the dough into a ball and place it in a pan to rest for another hour. Bake at 205 C for 10 minutes. Reduce the heat to 190 C and bake for another 10 minutes. Reduce the heat to 175 C, cover with aluminum foil, and bake for 25 minutes. Allow it to cool completely before cutting. This is a recipe for making a thin crust, NY style margherita pizza from scratch. As in, making the dough, sauce, and cheese on your own! 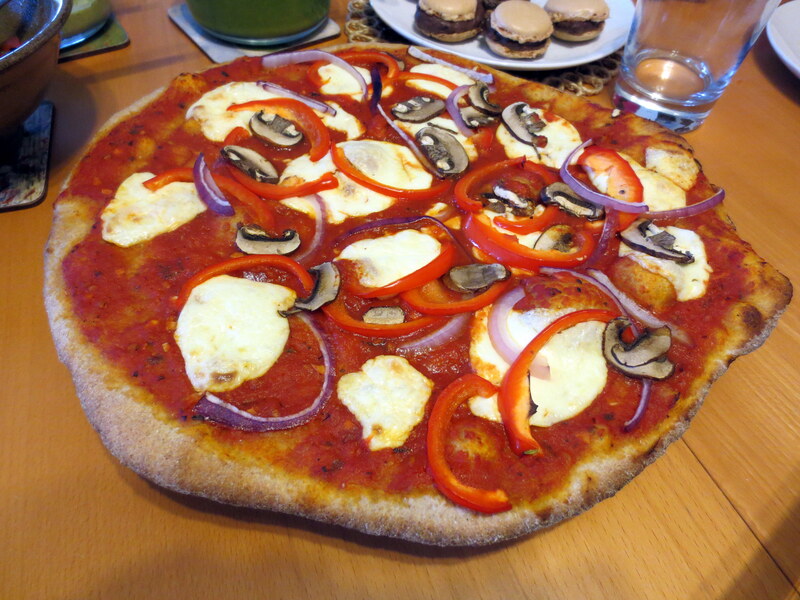 I made two 14″ pizzas with this recipe, and there was a lot of extra sauce left over. You should make the dough the night before, the sauce the morning of, and the cheese about 1 hour before. I used this recipe from seriouseats, and adjusted the recipe to make two pies. The dough has to rest for a day (ish) in the refrigerator, and then rest at room temperature for at least 2 hours before you plan to bake. Mix the flour, herbs, and salt in a bowl by hand. Add olive oil and water slowly and in parts. Mix well with your hands by gently kneading the dough. On a lightly floured surface, knead for about 10 minutes. You want a smooth ball. Don’t fold the dough over on itself. Windowpane test: Break off a marble sized piece of the dough. Try to stretch it out as thin as possible. If you can see through the dough without breaking it (like a windowpane? ), you’re finished. The gluten from the wheat makes the dough stretchy and nice. You have to knead and massage until you get to this point. Divide the dough in half. Store each half in a covered container. Let it rise for 1 day in the refrigerator. Remove from the refrigerator about 2 hours before baking to allow the dough to rest at room temperature. I used this recipe from seriouseats as my starting point, and adjusted the seasonings as follows. You have to simmer this thing for 2-3 hours. Use a food processor or blender to puree the tomatoes. It should be slightly chunky. Heat the butter and oil until the butter has melted. Add garlic, oregano, pepper, salt, thyme, and rosemary for about 3 minutes. Avoid browning the garlic. Add the tomatoes, basil, onion and sugar. Heat until the mixture is simmering. Reduce heat to the lowest setting and cook until the sauce is reduced by half. This should take 1-2 hours. I used this recipe from urbancheesecraft, and adjusted the seasonings as follows. There are great step-by-step photos on their site. It takes about an hour to make. You need a thermometer. These are enzymes for the cheese. Traditionally, they are found in the stomach lining of sheep and goats. You can get vegetarian ones from Amazon. Store the extras in the freezer. You can dechlorinate tap water by boiling it for about 20 minutes. Allow it to cool completely before using. Dissolve the rennet in 1/2 cup of dechlorinated water. Stir, set aside. Dissolve the citric acid in 1/2 cup of dechlorinated water. Stir, set aside. Heat the milk and citric acid solution in a large pot to 90F, stirring to prevent scorching. Add the rennet solution and stir for ~20 seconds. Don’t overstir, as the rennet will not like this. Heat to 105F. The curds should be coagulating. You can slice them into 1 inch cubes at this point. Stir the cubes gently for another minute and take it off of the heat. Separate the curds from the whey by using a cheesecloth or a slotted spoon. Ladle the curds in a microwavable bowl. Heat them for about 1 minute. Use a spoon (or hands) to fold the curds over several times to distribute the heat. Drain the excess whey. Microwave again for about 30 seconds and gently knead the curd. The curd should be 135F to stretch properly. Add the salt and herbs. Knead them into the cheese. Stretch and fold the cheese about 10 times to mix well. You can shape the cheese into a ball, braid it, or whatever shape you like. I found that a ball was the easiest to slice for the pizza. The mozzarella is ready to use! I used 1/2 of the ball for each pie. If you have extra, it will keep in the refrigerator for 1 week. Place the 14.75 inch pizza stone in the oven and preheat the oven to the highest temperature possible. On my oven, this is 550F. On a lightly floured surface, roll out the dough to a 14 inch diameter. Transfer the dough to a lightly floured plate, slab, or piece of cardboard. Whatever you choose, it should be large enough to accommodate the dough. We will put the toppings on this surface, and the pizza will slide off easily to the stone in the oven. Ladle the sauce to the dough. Use as much or as little as you want! Slice the mozzarella thinly, and place on the pizza. Add whatever additional toppings you desire (jalapenos, mushrooms, extra onions, bell peppers, etc). Bake for about 5 minutes. Check the pizza by lifting an edge and checking the bottom. If it’s browned, it is ready. If not, cook for longer. Oh, Italian food… Making me drool since I discovered spaghetti. Someday, I’m going to try making my own pasta from scratch, but that is all kinds of barrels of work, so I’ll settle for the store-bought kind for now. Tomato cream sauce is a special thing. You can make it a few different ways, and I looked at three recipes to come up with this one. It did turn out a little spicy, but I like it like that. This recipe will make about 6 servings. Heat the butter in a medium-large pot. When it’s hot enough to sizzle, add the onions, garlic, and mushrooms. Cook for about a minute or two. Stir in the oregano, dried basil, paprika, crushed red pepper, and black pepper with the vegetables. Let it cook for another minute. Pour in the tomatoes and vegetable stock. Add a dash of sugar and some salt, to taste. Let the mixture simmer for 30-45 minutes. Take the tomato sauce off of the stove. Stir in the heavy cream, most of the fresh basil, and cheese. Cook your pasta. Once it is al dente, drain (never rinse) the pasta and set it in the sauce. Reserve about 2 tbsp of the starchy water, and combine it with the pasta sauce. Toss well. Sprinkle some remaining cheese and fresh basil on each serving of pasta.